In an effort to use social media for good, Facebook has rolled out new methods of helping suicide prevention. 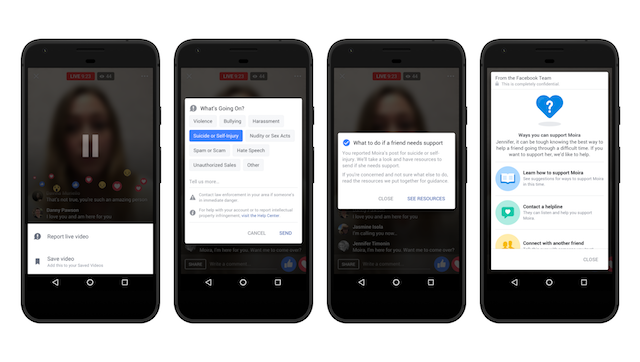 The leading social media company is incorportating suicide prevention tools into the latest feature, Live Videos so that it can provide aid in real time. It was unveiled that this live chat support from crisis support organisations on Messenger and streamlined reporting for suicide, will be powered with the help of artificial intelligences. Through integrating suicide prevention tools into this new Live videos, viewers are now given an option to reach out to the broadcaster immediately and also report video to it. Facebook will then list a set of links on broadcaster’s screen to either contact a friend or call up a helpline. Some of Facebook’s partners include organisations such as Crisis Text Line, the National Suicide Prevention Lifeline and the National Eating Disorder Association to provide live chat support on Messenger. Users of Facebook Messenger will now be able to chat with someone without any delay from the organisation’s Page. Furthermore, Facebook is testing a new artificial intelligence-based streamlined reporting method, one that identifies patterns in posts that have been previously flagged for suicide. The algorithm tests for pattern recognition so that posts can be identified as to whether they are likely to include thoughts of suicide. A small and limited test has already begun in the US.